Polygonum scandens. U. Mass. Amherst.extension.umass.edu. (Accessed7/2014). Polygonum scandens is a perennial, slender, twining vine to 5 m, stem usually angled, often red when growing in sun; leaf sheaths membranous, encircling stem. Leaves alternate, heart-shaped, to 13 cm long. Flowers whitish, to 0.2 cm, broadly 3-winged, widest above; inflorescence of unbranched, elongate clusters to 20 cm long, 3 cm wide; blooming and fruiting Aug.-Nov.
Fruit dry, 1-seeded, enclosed in old flower parts, fruiting flower pale brown, membranous, to 1 cm long with wings to 0.3 cm wide near top; seeds black, shiny to 0.6 long, 0.4 cm wide. Habitat: Scrubby growth, edges, moist soil. Notes: Polygonum scandens var. dumetorum is European and is found Occasionally. It has flower petals 0.7-1 cm long with flat wings. Flowers of the two native varieties (var. 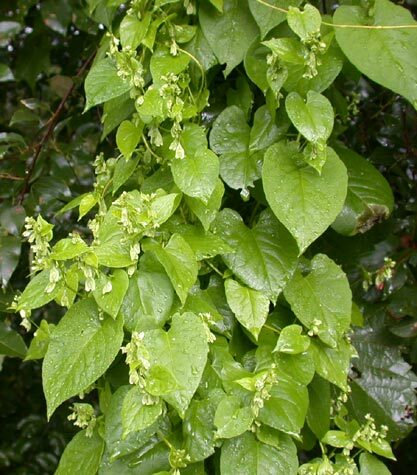 scandens and var. cristatum are 1-1.5 cm and wings tend to be wrinkled. P. scandens var. scandens is the most widespread variety. Flora of North America (www.efloras.org) list this as Fallopia scandens.